Lobstering and fishing has a special place in the heart of the photographer. It was the occupation of his father (John R.), his grandfather (Antone R.), and himself (John T.) in coastal Massachusetts, USA. Here are some pictures of inshore and offshore lobstering. The photo in the upper left corner of the home page is of the family lobsterboat on Christmas morning. 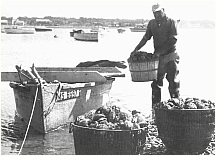 This section brings together all the known pictures of the Everett family fishing for lobsters, scallops, quahogs (hard clams) and codfish from Fairhaven, Massachusetts, USA, including from the Fairhaven-New Bedford Harbor. 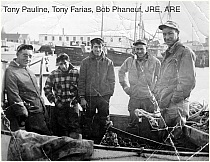 The earliest picture is of Antone Roderick Everett tarring funnels in 1938 on Union Wharf in Fairhaven, ending with the family boat retired to the "land down back". Photos are included of his sons: Tony, John, and Manny. 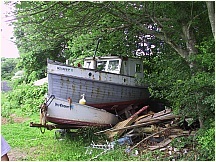 Once Antone retired, son John bought the boat from him and used it until itsank one night and was deemed un-seaworthy by the Coast Guard, somewhere around its 80th birthday. Lobster fishing is conducted along much of the Atlantic seabard of the United States, but it exists only along the edge of the continental shelf off the southern states of Virginia and North Carolina, in the form of offshore lobstering. In contrast, in the New England states and Canada, lobsters can be caught even in traps that are out of the water at low tide, trully inshore lobstering! See all the free photos: Photo Catalog. 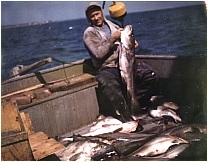 There are more free lobster fishing pictures under Pots and Traps and in Commercial Fishing. Click on any picture for a FREE larger version. Read the licensing rules (REVISED) for your needs. There are hundreds of high quality free photos: use the Google/site search engine. See our digital photography tips : DOs and Don'ts; Choosing a Camera and Accessories , Downloading Photos, and Editing Photos. Visit TechnologySite.org for free photos and lists of inventions and technology and learn Climate Change Facts to see for yourself if wildlife is at risk from global warming. Manny Everett sitting on a basket of quahogs in an early age. 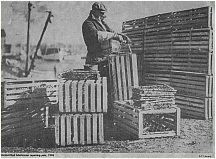 Tony Everett (Jr.) bringing bay scallops ashore in Fairhaven, Mass. 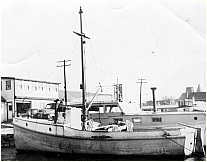 Lobster Boat of Antone Everett in its original configuration (35 feet [11 meters]) It was built in 1922 per Alden Trull. 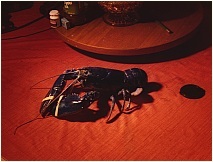 Freshly caught, angry lobsters in trap parlor, Fairhaven, Massachusetts. Lobster pots being ferried ashore in Little Bay, Fairhaven, Massachusetts. 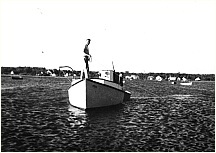 Lobster boat (original configuration) at mooring in Little Bay, Fairhaven, Massachusetts. 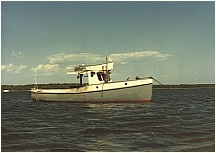 Lobster boat being hauled at Ocean View, Fairhaven, Massachusetts.